YTD Net Change: 4-3/4 yards out. Yay, still in the black for the year!!! 2. Prep PAussietivity & its backing and take to the long armer. DONE. Not only that, yesterday it came back from the long armer, ready to be bound and finished. 3. Plan and write up secret project, a collaboration with Alycia for later. Planned and written. Cut lots of pieces and started secret sewing. 5. 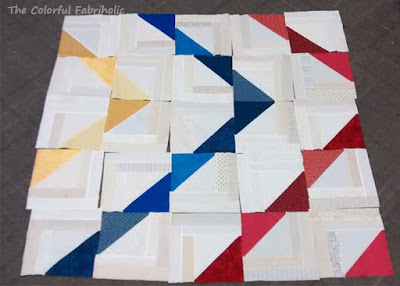 Layer, baste, and quilt QF 2015 alternate blocks quilt. NOT TOUCHED AT ALL. When I wrote the July goals, I didn't know if Maple Leaf Star would come back from the quilter yet. It did, so I was able to complete the SID quilting and bind it. 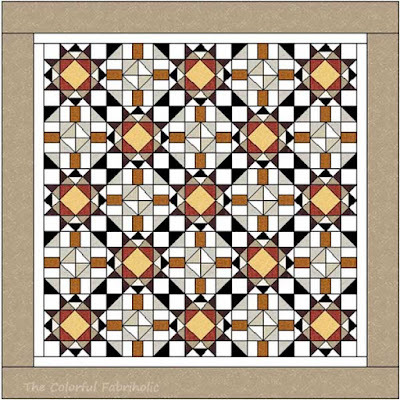 That, and a Heart Builder project that came up unexpectedly last week prevented me from working on the QF 2015 alternate blocks quilt. 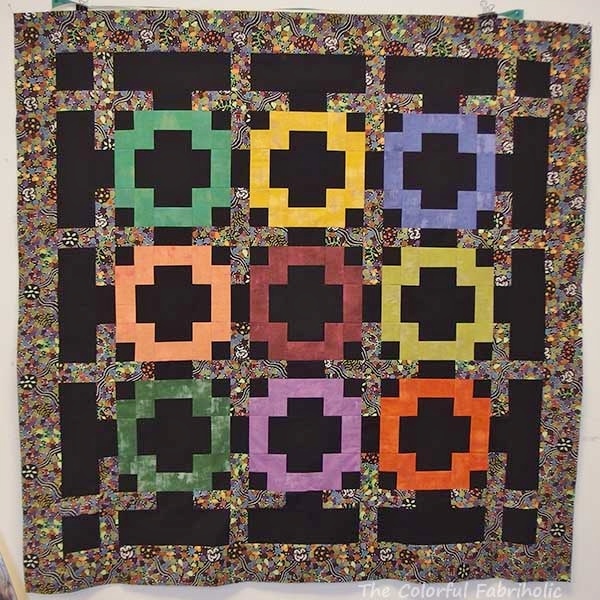 Due to some pressing deadlines, the QF 2015 alternate blocks quilt will have to wait until September. 1. Bind, label, and add sleeve to PAussietivity & deliver to LQS for class sample by Aug 5. 2. Work on secret project, collaboration w/ Alycia, to be ready to post by Sept 1. 3. Finish Laurie's baby quilt top. 4. Make top for Heart Builders for My Stuff Bag (from Stash Builder Box). I signed up to be a top piecer for Heart Builders. Sponsored by Stash Builder Box, Heart Builders are volunteers who piece tops, or quilt, or bind & finish quilts for My Stuff Bags for kids in foster care. Last week fabric arrived for my first top, and I get to make any pattern I want. 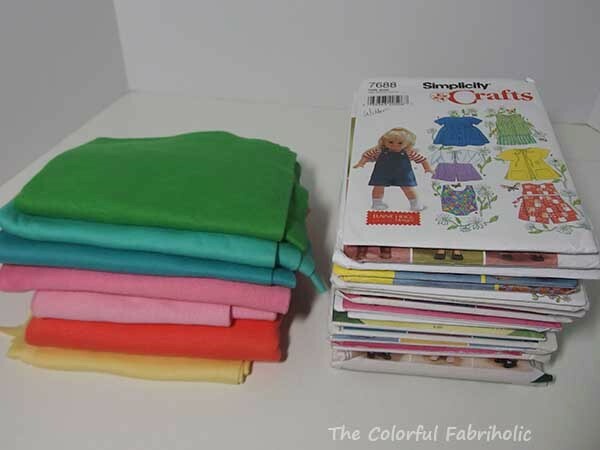 I can add add any fabric from my stash if I want to. I received a yard of this green print and a yard of solid white. I like that it's gender neutral. I found a blue, an orange, and a stripe in my stash that will work with it, and I've started cutting and piecing. Come back tomorrow for Design Wall Monday to see progress so far. I'm not counting in any of the fabric they sent because I'm using it all, but I will count out the amount of my own stash fabric that I use for this top. I need to get the top finished and sent back by the end of August. 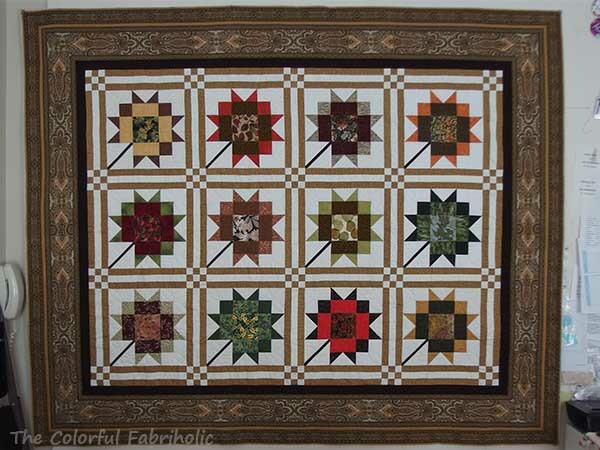 A couple weeks ago I had Log Cabin Triangles (LCTs) on my design wall. I was talking with my friend Gwen about an upcoming project, and she invited me to work with her small quilting group. Gwen and some of her coworkers at Scottrade of St. Louis make Quilts of Valor, with the approval and sponsorship of Scottrade. Yesterday I had the privilege of sewing with them and sharing my Log Cabin Triangles block. We were pattern-testing the instructions for an upcoming project, which I'll be able to reveal in September. Look at all these blocks we got done in just a short time! Gwen had all the pieces pre-cut, and I brought along some pre-cut background pieces as well, so we were able to get right into sewing. One of the best things about sewing with others is how ideas feed off one another. 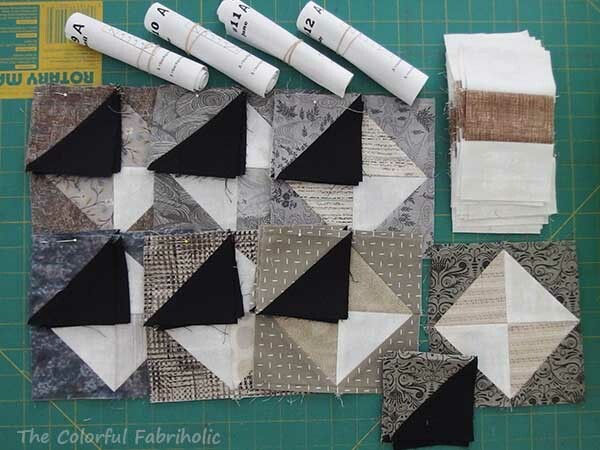 One of the participants yesterday, Lenore, envisioned the LCT block using Kaffe Fasset fabrics with black & white prints. How inspiring! So after a few clicks in EQ, here's a rendering of what it could look like. 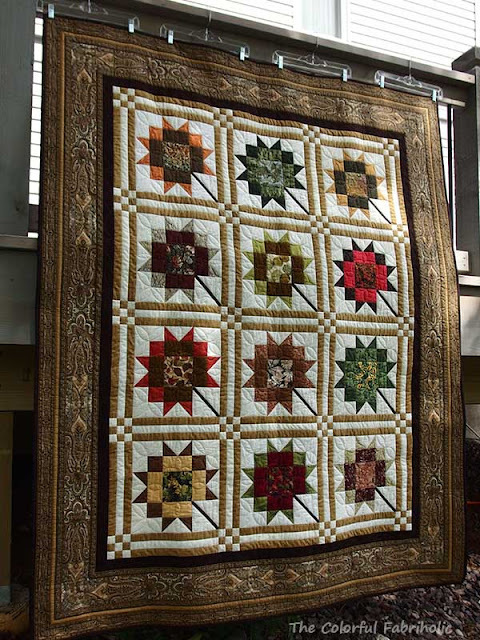 Don't you just love it when quilters get together and inspire each other?! 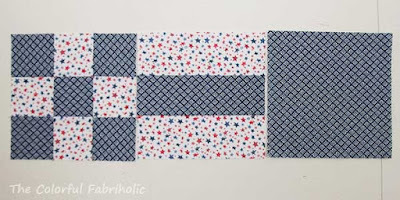 Linking up today with Whoop Whoop Friday over at Confessions of a Fabric Addict, because the opportunity to sew with and be inspired by other quilters is certainly whoop-worthy! Not much new to show, even though I had a busy week in the sewing room last week. 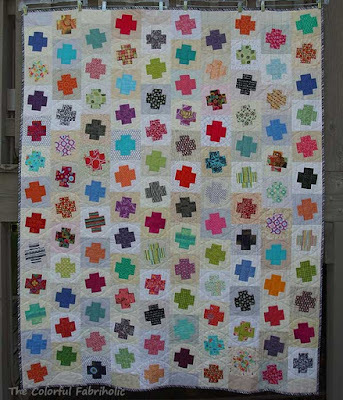 My design wall still has the start of the baby quilt on it that I showed in last week's post. It also has some QOV blocks for a block drive at my guild. I did a lot of cutting and sewing last week, but I was working on a secret project so I can't show it yet. Sorry, I don't have much that's very inspiring to show here today. 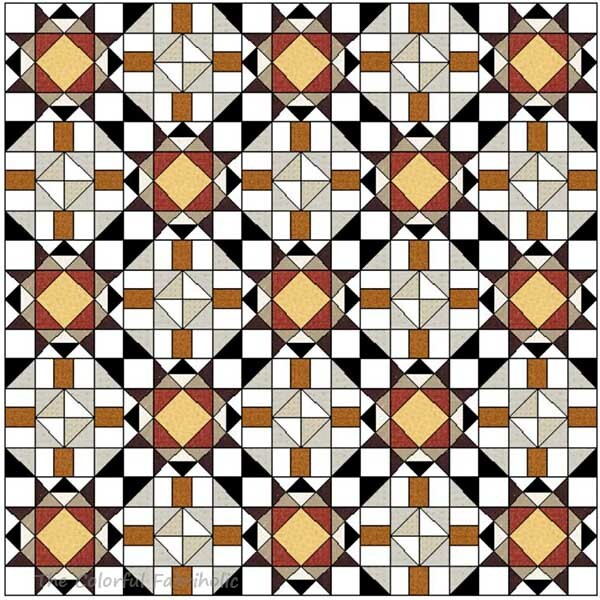 For inspiration, check out the other design walls over at Patchwork Times. Nothing in this week. Yay! Nothing I can count out. I already counted the fabrics for the gift pillows featured in my 12 Days of Christmas in July post - scroll down to the post below. 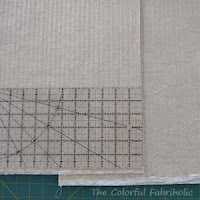 You can see all the posts in the blog hop from the links over at Confessions of a Fabric Addict. I've been cutting lots of fabric and sewing a lot this week, but it's a secret project and it's not far enough along to count any fabric out yet. 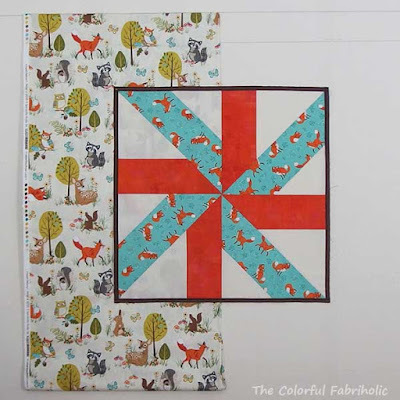 Welcome to my stop on the 12 Days of Christmas in July Blog Hop, organized by Sarah over at Confessions of a Fabric Addict. A big thank you to Sarah, for organizing and hosting this blog hop! Be sure to check out the other bloggers' posts, too, including Michele at Crayon Box Studio who is also posting today. I'm planning some hand-made Christmas gifts this year. But they're not made of Christmas fabrics; instead I've chosen colors that I know will appeal to the recipients. My husband and I celebrate Christmas with his sister's extended family including her in-laws. 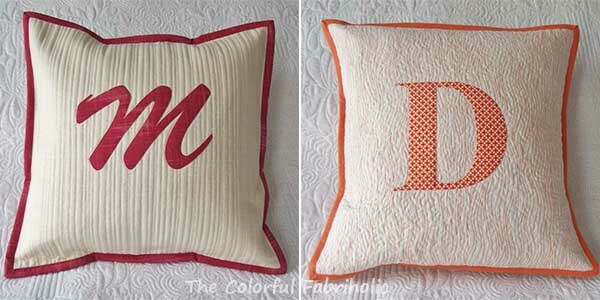 So I'm making monogrammed pillows for D and M. I chose orange for D, her favorite color, and raspberry for M, the accent color in her living room. So, no Christmas colors or holiday-themed fabrics here. But I've made a good start on my hand-made gifts, and I think the recipients will like them. 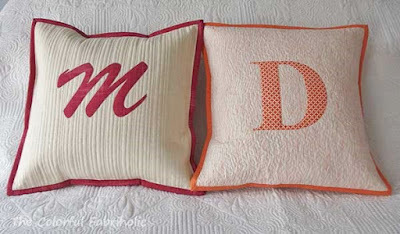 These pillow covers were so easy to make that I'm sharing a tutorial here. There's plenty of time between now and Christmas, and these don't take very long at all. Pillow size 16”. Skill level: Confident beginner. 1. Determine monogram font and size. 2. Cut freezer paper to 8-1/2” x 11” and place in printer so printing will come out on the plain unwaxed side of the freezer paper. Print. 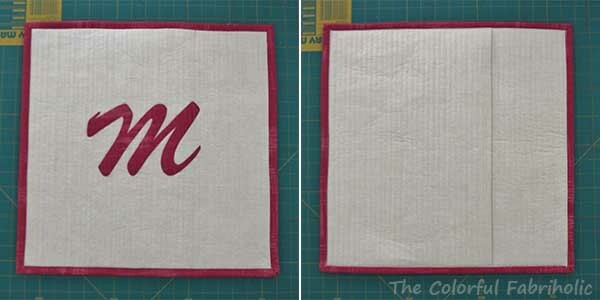 Trim printed freezer paper to about 1” larger all around than the monogram letter. 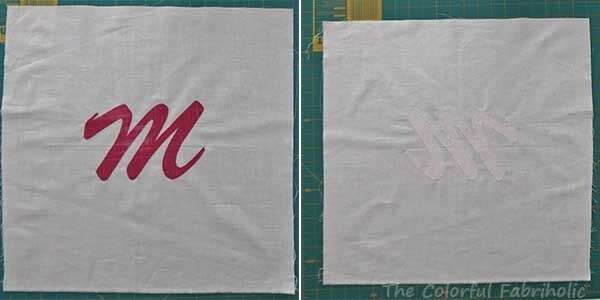 3.Cut feature fabric for appliqued monogram to about 8 by 10 inches; must be larger all the way around than actual applique. 4. Apply Wonder Under to wrong side of feature fabric following product directions. Leave backing paper attached. 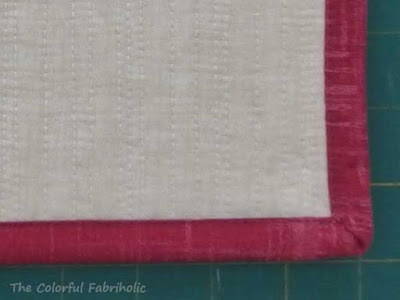 5.After Wonder Under has been applied to feature fabric, iron the freezer paper to the face side of the feature fabric. 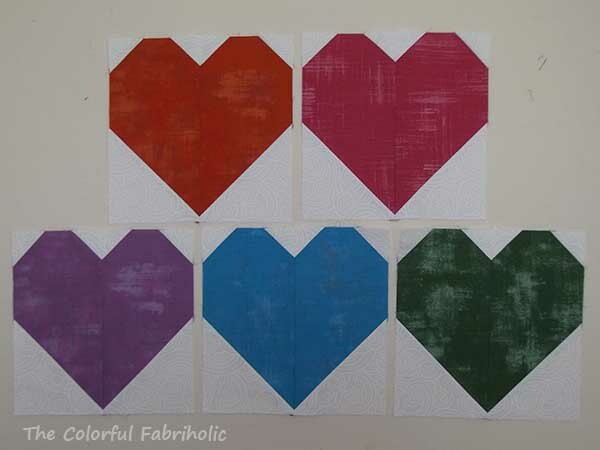 This results in a sandwich of freezer paper, feature fabric, Wonder Under and backing paper. The applique initial should be face up. 6. With the freezer paper adhered to the feature fabric, carefully cut around the motif. Remove the backing from the Wonder Under. 7. TEST: before proceeding to the actual pillow cover, test applique stitching using the cut away parts from the applique motif. 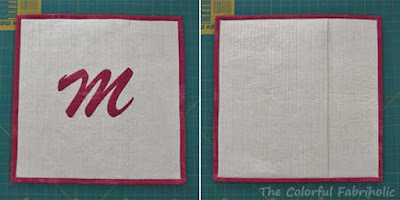 - Position applique on scrap of background fabric and press to adhere following product directions. 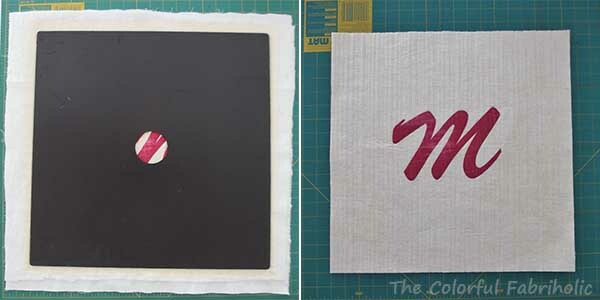 Tip: leave freezer paper attached to avoid distorting motif; when adhered, remove freezer paper and press again. - Place tissue paper or stabilizer on the wrong side of the background fabric and pin, keeping pins out of the way of the applique. 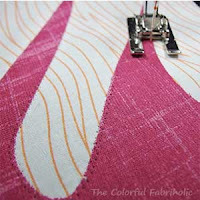 -Using zigzag stitch or decorative stitch of your choice, stitch around applique. Samples are stitched using Mono-Poly on top, Aurifil 50-wt white in the bobbin; stitch length 1mm and zigzag width 2 mm. - Start and end zigzag in the middle of a long stretch, not in a corner; overlap ½” past the start of stitching at the end. - When going around an outside curve, stop with the needle on the outside and pivot. When going around an inside curve, stop with the needle on the inside. 1. 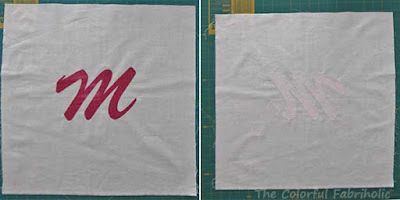 When satisfied with your test, applique the letter to the background fabric. 3. Cut batting and lining (muslin) to 19” square. Layer lining face down, batting, and top face up; pin baste. 4. Quilt as desired. 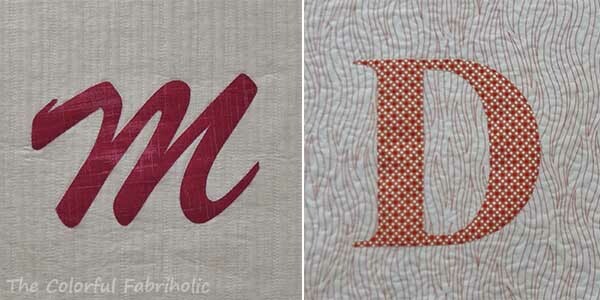 For curvy script I used straight line matchstick quilting and for Times New Roman I used FMQ stippling. 5. Cut two pieces of background fabric 19” x 12-1/2”. Cut two pieces of lining (muslin) and batting slightly larger. 6. Layer and baste. Stitch 1” from long edge of fabric and then quilt as desired to coordinate with pillow front. 7. Fold fabric away from edge along the 1” stitching. Trim batting and lining (muslin) close to fold, being careful not to cut the folded edge. 8. To hem edge, press top fabric to the back, then press raw edge under ½” and pin in place. Stitch hem. 1. Trim quilted top to 17” square. Tip: If you have a 17” rotating cutting mat, separate the layers and use the back as a template. 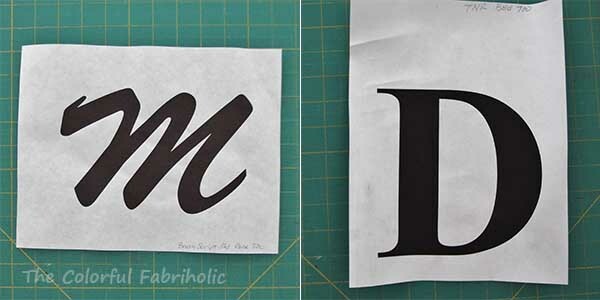 The hole in the center will enable you to position it over the center of the monogram. Trace around the outside edges of the mat. 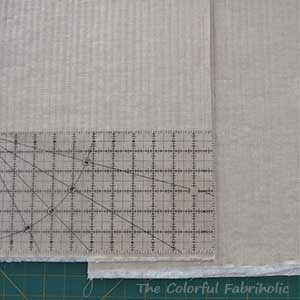 This is 17-1/2” so trim ¼” inside the marked lines. 2. 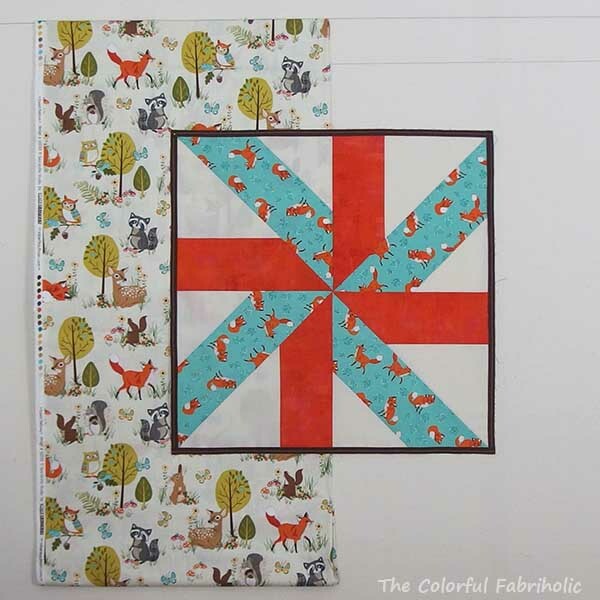 Trim the layered and pinned back to 17” square. Baste overlapped edges of back together. 3. Place pillow back and front wrong sides together, right sides out, and baste around all edges. 4. Prepare binding: join two 3" WOF strips and press in half lengthwise. Due to the thickness of the quilted layers, 3” wide strips are recommended. Binding will finish at ½” on the front. 5. 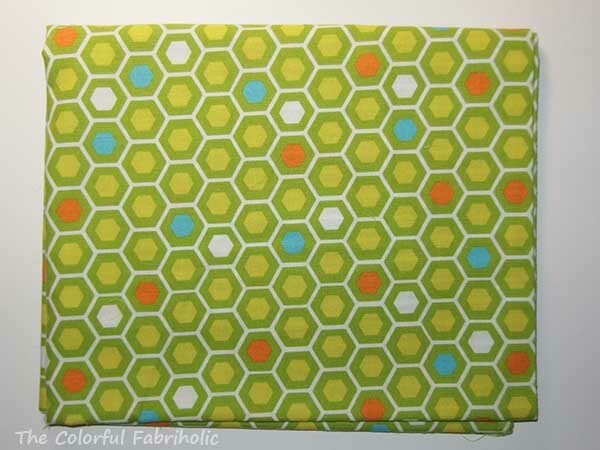 Attach binding to the back of the pillow using a 3/8” seam allowance. Miter corners as usual, and close the binding using your preferred method. 6. Press the binding away from the back. 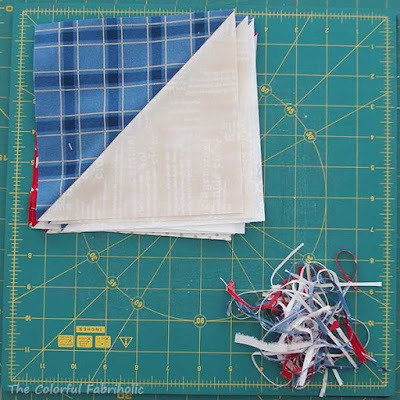 Pin, clip, or glue-baste it down to the front and stitch down by hand or machine. Samples were machine stitched down using Mono-Poly thread. 7. Insert pillow forms. 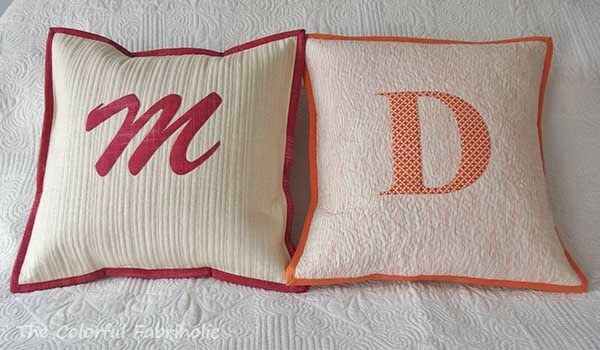 Voila, finished monogrammed pillows, ready for gifting. Is there someone on your gift list who would like a monogrammed pillow? So easy and so fast. These took me two days, but only because I kept stopping to take photos and write down the steps. Start your Christmas making now and you'll be done ahead, with plenty of time to bake cookies at Christmas! Check out the other stops on the 12 days of Christmas in July Blog Hop. Sarah has the complete list over at Confessions of a Fabric Addict. Thanks for visiting, and have fun with your Christmas in July sewing! Another great-nephew is on the way, due in early October. Last month I planned out a baby quilt in EQ and I ordered these cute Forest Fellows prints (Robert Kaufman). I was quite surprised at the scale of the large print compared to the EQ rendering. The tree/deer motif is 6-1/2" high, much taller than the EQ image suggests, and the racoon is about 3" high. 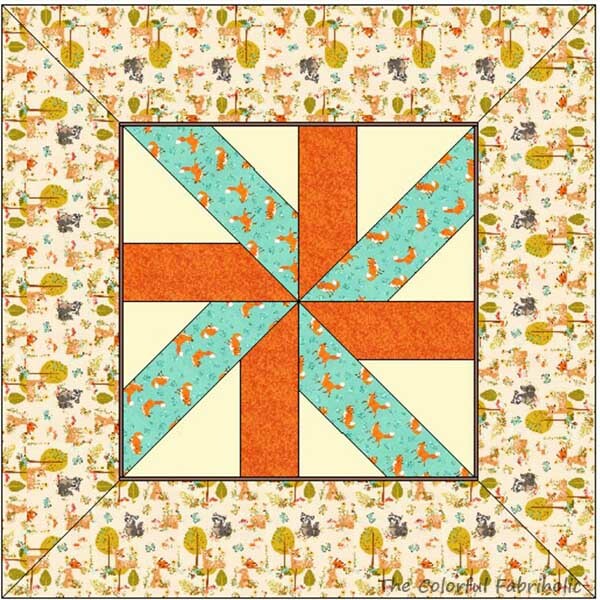 In the EQ image below, the borders are 8" wide and the deer/tree motif looks like less than 4" high. 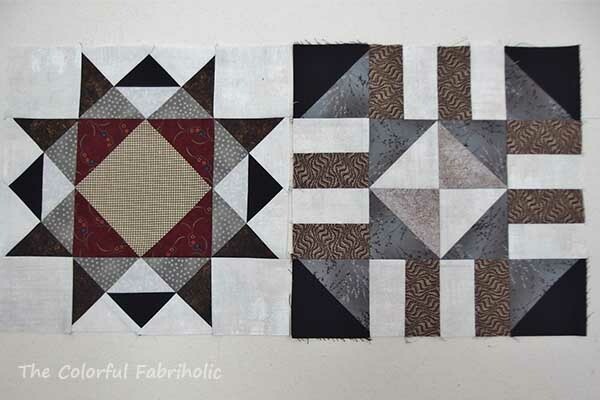 I revised the block design and kept the piecing simple and large as shown here to feature the fabrics. Here's what it looks like on my wall. The piping around the center will finish at 1/4". I'll make the borders as wide as possible to miter the corners so the print can face outward on each side. I have enough yardage that I can cut the WOF strips to feature the best parts of the print and/or minimize the number of animals that are cut in half. I have plenty of fabric and I'm planning to use it for the backing as well. Although the scale of the print is larger than I was expecting, I think it'll work. The theme and colors are perfect for this family. So that's what I'm working on this week. Linking up with Patchwork Times and Sew Fresh Quilts. Now that Maple Leaf Star is finished, I can count out the backing and binding. Actually I had to purchase the binding fabric - not enough left from the inner border - so I have to count it in as well. 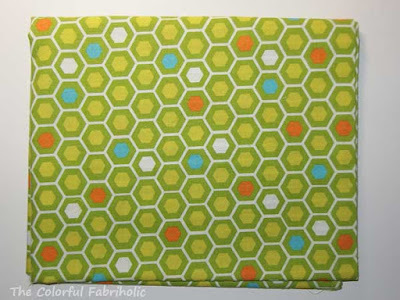 OUT this week: 2-3/8 yards wide backing and 5/8 yard Kona for binding. Still moving in the right direction and in the black for the year. 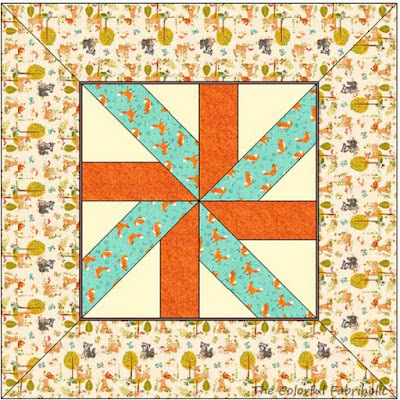 Maple Leaf Star, approximately 64" x 80"
In other news, Sarah over at Confessions of a Fabric Addict is hosting the 12 Days of Christmas in July Blog Hop. Check out everyone's posts through her links. My turn to host is this Thursday and I'll be sharing some Christmas gift pillows I've made. Maple Leaf Star, about 64" x 80"
A Friday finish! Maple Leaf Star is done, quilted and bound. The blocks were the main block in a local shop's BOM series last year. The setting is my own. The quilting is a collaboration with my long-armer friend Sandy; she did the FMQ motifs in the blocks and the borders, and I did the SID in the sashing. I wanted the quilt to be soft and drapey, so the quilting is not overly dense. Check out those mitered borders - not bad, huh?! This quilt is destined to become a Christmas gift for some family members. Nice to have it finished ahead of time! Speaking of Christmas, Sarah over at Confessions of a Fabric Addict is hosting both a Christmas quilt-along and the 12 Days of Christmas in July Blog Hop. I hope you'll visit Sarah and check out all the stops on the blog hop. My turn to post comes next Thursday. ... Or, when a friend shares a better idea, use it. Several of my friends and I are participating in a local shop's BOM. We go out for coffee after the meetings, and gab for awhile. Lots of sharing about what we're working on, what's going on in our lives, travel plans, etc. I always enjoy our coffee get-togethers. The current BOM series is in the final month. Each month there's a main block (left) and an optional alternate block (right). The series is inspired by the Roman road, hence the stone and brick color palette. The original alternate block as shown has four pieces in the side units, so the center seam has to align with the center point of the main block. My friend Cherie of The Quilted Jonquil suggested that if the side unit had three pieces instead of four, there would be no seam to have to match up at the center point. She made a sample, which you can see on her design wall directly below her name. When she first showed us this option, I offered to mock it up in EQ for her so she could see if she liked it. This was about four months ago. I had finished eight of the original alternate blocks at that time. I liked Cherie's option so much that I started taking apart the alternate blocks I'd already completed. I have all but one disassembled, and all the new side units pieced and ready to reassemble them. 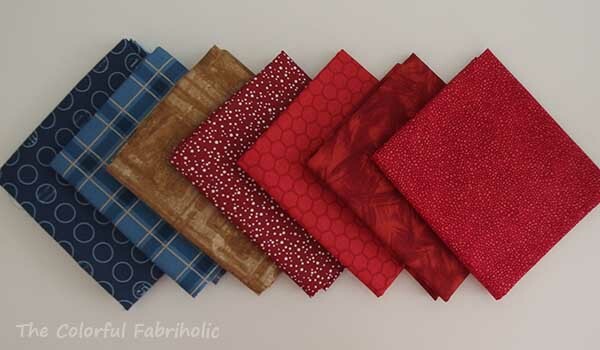 My layout requires 13 of the main block, so I searched through my stash and found fabrics that will work nicely. 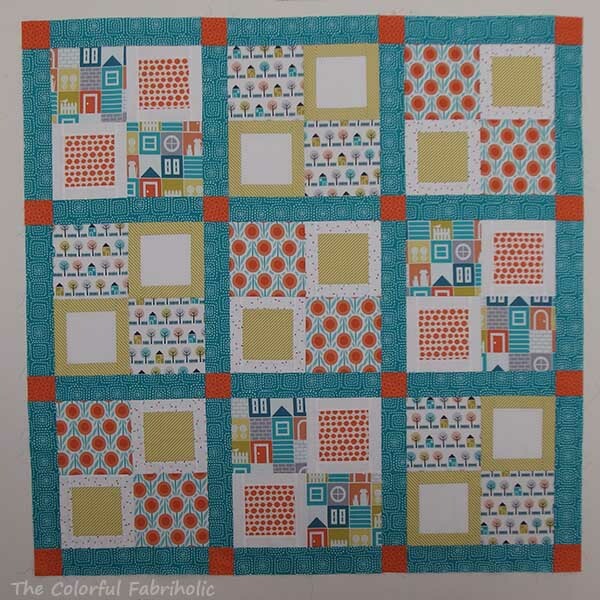 I'll add a small border of the background white Grunge to float the blocks, then a wider border of a taupe print. I may have one in my stash that will work, but I need to see if I have enough of it. EQ Layout with Borders, 76" x 76"
So that's my plan. Actually the shop is presenting their finishing kit for sale at the next BOM meeting. I've heard it involves very narrow sashing. 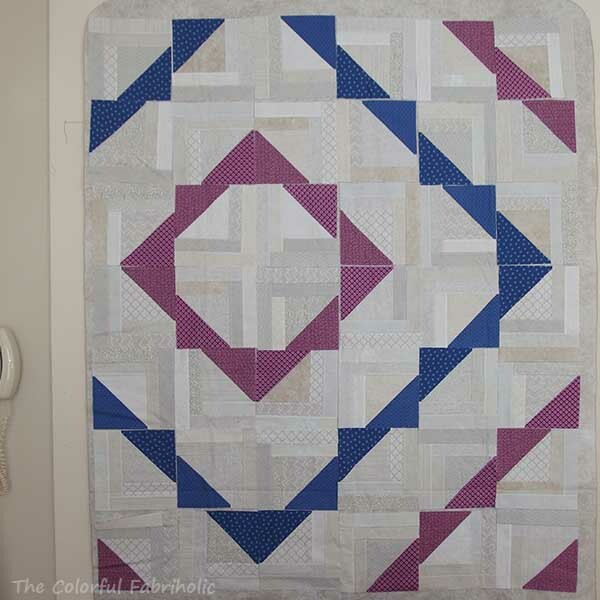 I really like the graphic secondary pattern of my layout, so I don't think I'll be using sashing. Don't you just love it when quilter friends get their heads together? Thanks, Cherie, for sharing your brilliant block revision. In other WIP Wednesday news, I've finished the SID in the Maple Leaf Star quilt but now I have a lot of thread tails to bury. Then I need to find binding fabric. Maybe by Friday I'll have a finish! 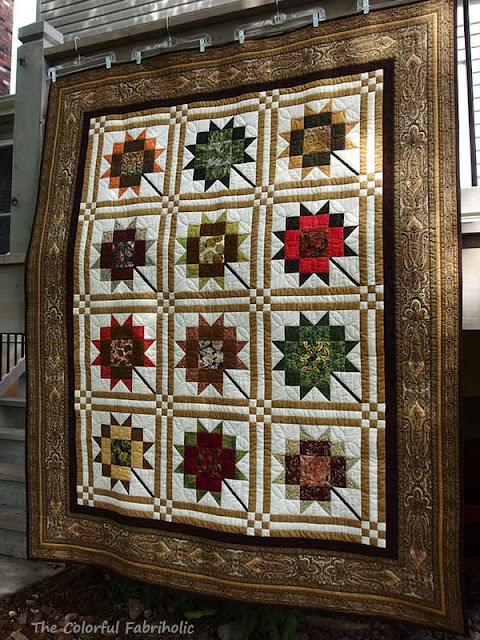 Maple Leaf Star is back from the long armer, but now it's my turn to finish the quilting. My talented friend Sandy does custom long arm work. She's so popular that her wait list is usually about nine months! Together we had a plan for this quilt. 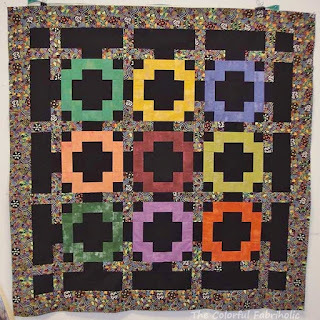 She basted it and custom quilted the motif in the blocks. 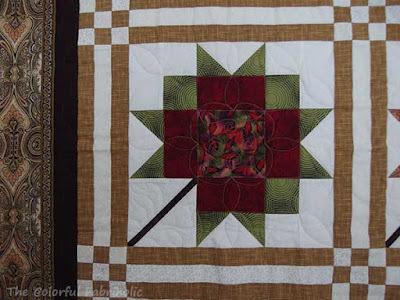 She also quilted the borders by following the shapes of the paisley print. 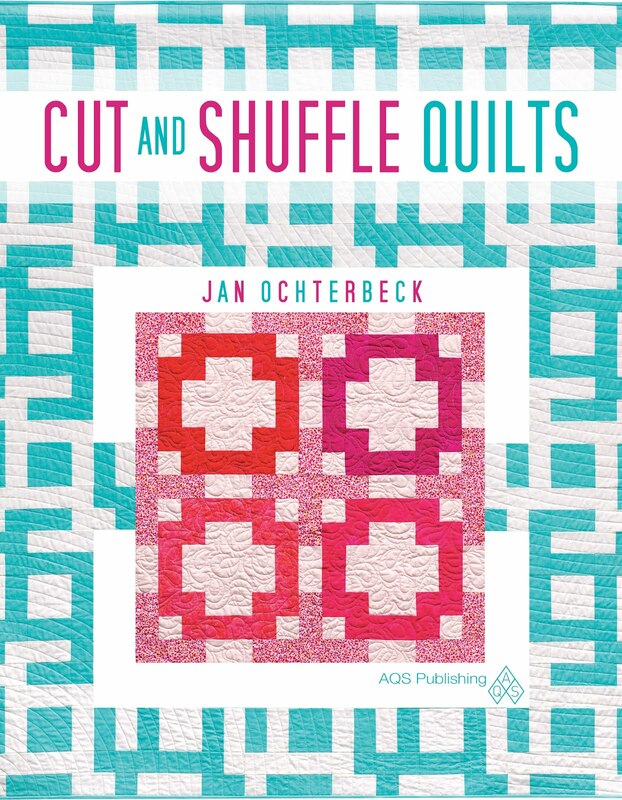 I'll quilt the sashing with stitch-in-the-ditch using my walking foot. 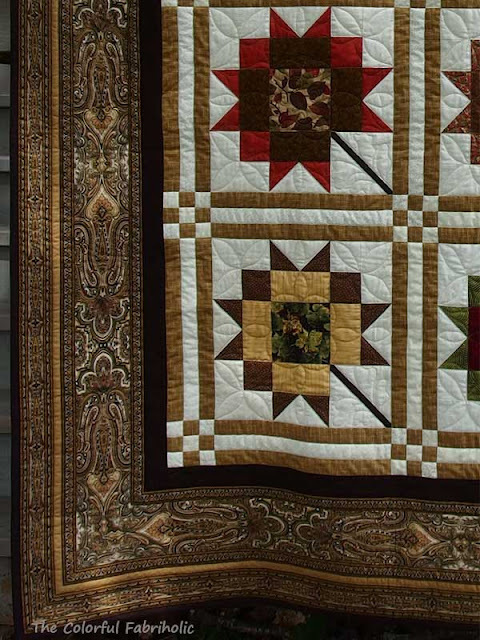 Since the quilt is fully stabilized, I can get the stitching down into the ditch better on my domestic machine. But since I can't FMQ, there's no way I could have managed the blocks or the border. So, a collaborative quilting effort. One of my goals for this month is to get this finished and bound, so I need to clear space in my sewing room and get busy. 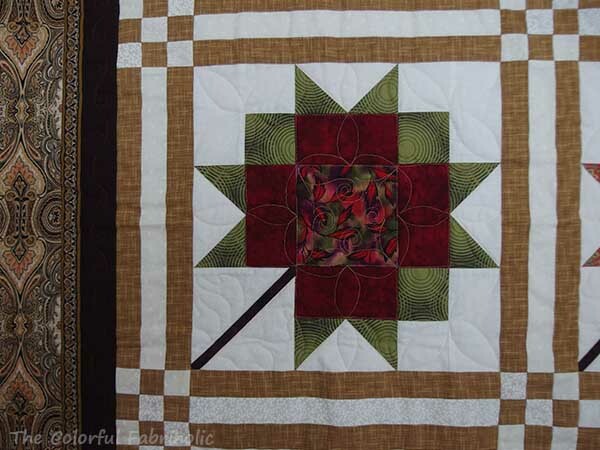 Linking up with Judy at Patchwork Times; check out other design walls over there. I cannot resist a fabric sale! When one of the local quilt shops advertised FQs for $1, I had to go check them out. 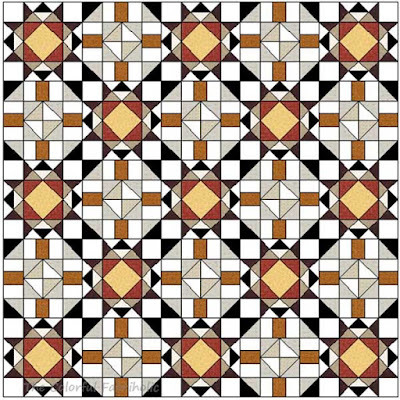 I'm specifically looking for colors to make QOV blocks; my stash is lacking in red and dark blue. 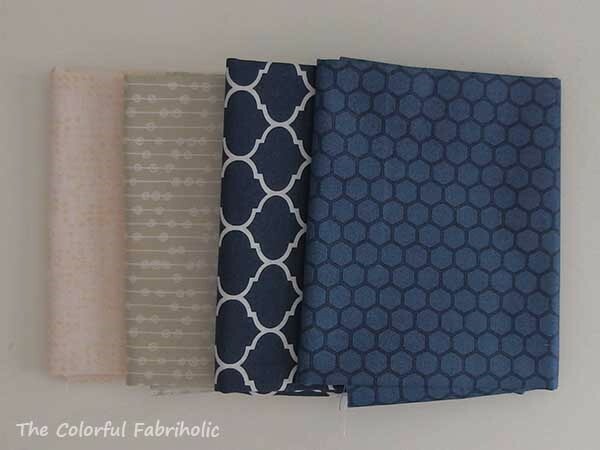 So these came home with me on the first day of the sale: six FQs and a half-yard cut of dark blue from the sale table. Then my friend Libby from Tennessee who blogs at Life on the Hill was in town yesterday. I took her to the STLMQG meeting, lunch with my bee, and then shopping at three of the local quilt shops. We had a great time! Again, of course, I succumbed to the lure of $1 FQs. A couple of good neutrals and two more dark blues joined my stash. Libby & I had so much fun! Check out her post here. Our husbands joined us for a lovely dinner last night. Can you tell we had a great day?! Based on last week's numbers I'm still in the black for the year, but by less than a yard. The blog has been kind of quiet lately. I've been sewing, and writing, but I can't blog about it yet. You see, I'm saving it for my turn on the 12 Days of Christmas in July Blog Hop hosted by Sarah at Confessions of a Fabric Addict. I can tell you that I've made a nice start on my Christmas gifts for this year. I was able to accomplish a lot this week, including a lot of writing. My Christmas in July blog post will include a tutorial, and I've been hard at work on it. The blog hop runs July 14-25, and my turn to post is on the 21st. I'm looking forward to seeing everyone else's posts and projects. Maybe it will inspire me to make some more hand-made Christmas gifts. So even though I don't have anything exciting to show for it, it's been a good quilty week here. I hope your week has been good, too. I felt like every time I turned around I was buying fabric this month! But when I tally everything up, it turned out to be a really productive month with a lot more finishes than I realized. 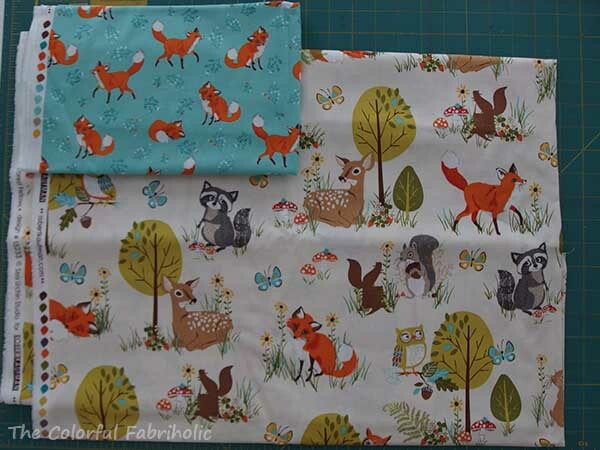 My latest fabric purchase: I ordered these cute Forest Fellows prints for a baby quilt for my niece who's expecting her third boy in October. These will make a cute little boy quilt. I found some Orange Grunge to go with them, and I have some Kona Bone in my stash for background. The forest print will be borders and backing; the aqua foxes will be used in the pieced blocks. 2. Piece one new top at Sew-in and GS camp. DONE; pieced LCT blocks and pieced blocks & finished magazine challenge flimsy. 3. Finish collecting fabrics for PAussietivity and cut out. DONE; not only cut out but flimsy complete, backing purchased. 4. Plan and organize 12 Days of Christmas In July blog hop project & post. DONE; projects are sewn and photos & notes are prepped to write tutorial. 5. Make one doll outfit. DONE, made two tee shirts, jeans, & denim skirt. 7. If returned from the long armer, finish SID quilting on Maple Leaf Star. Not back from the quilter yet. Wow, I didn't realize I accomplished so much this month! No wonder my stash numbers looked good. My bee's Sew-In and a 3-day retreat at GS camp really helped. Plus I stayed home in the air conditioning a lot this month and it turned out to be really productive for me. 1, Write and post 12 Days of Christmas in July tutorial, to go live 7/21. 2. Prep PAussietivity & its backing and take to the long armer. 3. Plan and write up secret project, a collaboration with Alycia for later. 4. Work on Laurie's baby quilt. 6. 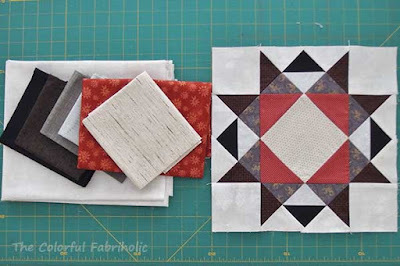 If returned from the quilter, finish SID quilting and bind Maple Leaf Star. OK, that should keep me busy! And just because I feel good about accomplishing so much in June, here are pics of some of my finishes. One of my ongoing projects is the making of doll clothes for my great-niece's Christmas gift. 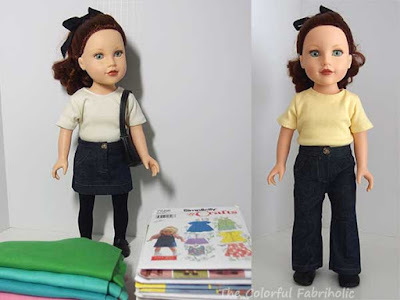 You may remember, I scored a doll in beautiful condition at a thrift store earlier this year, and I'm making one outfit or accessory set a month 'til Christmas. My friend Jeanne is such an enabler. She used to make doll clothes for her granddaughters so she understands my obsession. She loaned me all her doll clothes patterns and gave me some interlock fabrics. More than I can ever use. But so fun! I had a bit of denim left over from I don't know what, so I decided this month's wardrobe additions would be tee shirts and jeans. So, another monthly goal met and progress made toward Christmas gift giving. Whoo Hoo!